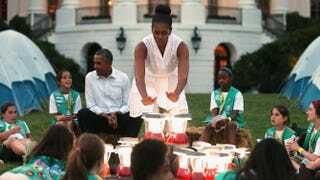 First lady Michelle Obama pretends to warm herself over a “fire” made from battery-powered lanterns as she and President Barack Obama host a group of Girl Scouts from across the country for a campout on the South Lawn of the White House June 30, 2015, in Washington, D.C. It seems there's nothing that first lady Michelle Obama won't do to stress the tenets of her Let's Move initiative that gets children to take exercising and eating healthy seriously, including turning her backyard into a campsite for 50 Girl Scouts. That's right: On Tuesday the White House South Lawn was littered with marshmallows, tents, campfires—well, battery-operated lanterns made to look like campfires—and 50 fourth-grade Girl Scouts from councils in the area, the Associated Press reports. They rock-climbed, tied knots, sang songs, spoke with President and Mrs. Obama, and picked up a new outdoor badge along the way. "This is something you can tell your kids and your grandkids," Michelle Obama said. "Do you understand the impact, the importance of this moment today? It's exciting." She's right. Aside from how rad it is to be an 8-year-old tossing in a sleeping bag on White House grounds, the event, as the first lady mentioned, was especially significant because this was the first time White House grounds had been turned into a campground, AP reports. Michelle Obama is the honorary national president of the Girl Scouts, so it's only fitting that she make use of the outdoorsy Girls Scouts organization to bring attention to her office's efforts to promote a healthier lifestyle for children. President Obama even stopped by to joke with the young ladies. "What are you guys doing in my yard?" the president asked. "When did you guys show up here? "You guys aren't going to be making a racket, are you?"